Drumka was a coincidence. She was born the same day as my Delphine died . It was a sign, and so I perceived myself and breeder Lorra Miller. 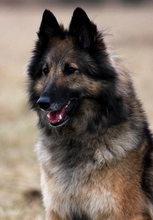 Drumka comes from two groenedaels, two beautiful and clever parents (the father of Spanish beautiful dog S.R. Besos De D'Artamas and mother is US BISS Ch Isengard's Taliesin), that is unrelated to most tervuerens. At the time a new puppy not even thought about the loss of Delphine ached home pack + Juki and Prot with which we are intensively trained and we agreed with my friend and breeder Hanka Abrahampva (CHS Moravia Merilen) and Drumka lives with her daughter Vlaďka. Drumka - What is it? She is beautiful, delicate, elegant. It's such a doll, sweet and very kind to his family, guards (but nothing serious), is no reaction to the shooting or strange noises. 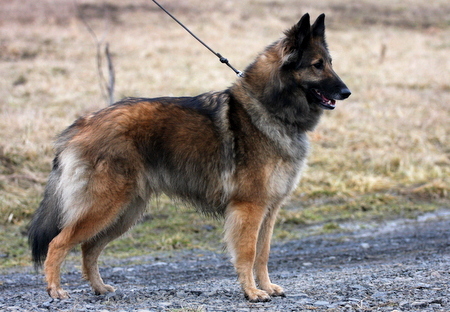 She has a very beautiful bones, head with great lines, a beautiful rich coat and excellent movement. With Vladka doing agility "for fun" it is mainly with family dog ?and companion. She has a strong talent for herding. She is very easy to handle.